My trip May 2013 after huge rain in Baton Rouge. Reason read Grits Gresham from 1950’s and he fished this area which at one time was good fishery. 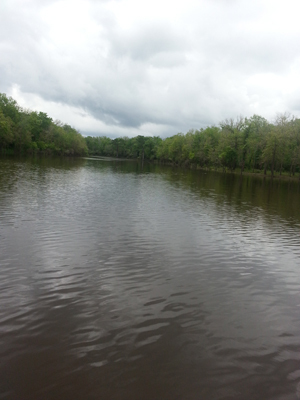 I went to Three River WLF Mgmt area to hog pen bayou back May 2013. Did not go to sunken lake due to that road a little more questionable. Hog pen very easy to get to and not a bad launch. Roads are basic one lane gravel, but nothing where you will get stuck. I drove in a 2012 Chevy truck 2wd right after heavy rain no problems. 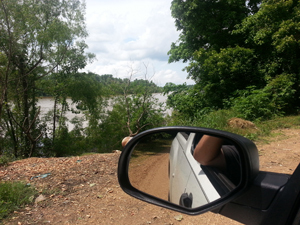 Enclosed a picture overlooking red river from gravel road to get in place. Anyway got to landing which easy to launch in small boat. Lake avg 4ft deep, so I used trollmotor whole time. Got there right after rain and actually was only person out there. Fished a lunker lure and rebel top water caught 43 bass inbetween 1lb to 2lbs quickly less than 200ft from launch. Once sun came up the fished died off, and was greeted by only one other boat all day. Got off water around 12pm and 1hour 45 minute ride back to baton rouge. Not the greatest place to fish, but not a bad place for a guy in a small boat to fish. By only beef is it has a lot of trash fish, a lot of gators, and not a place I would run an outboard. Both Hog Ben Lake and Lower Sunk Lake can be accessed by vehicle. The roads are accessible with a 2-wheel drive truck. The fishing on these lakes cycle in and out of productivity. 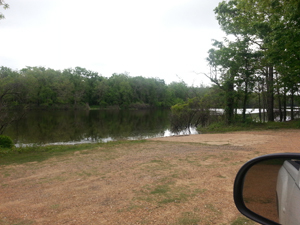 This should be a good year based on the backwater flooding from the Red River each of the past two springs. Fishermen had some success last year but fishing has not really cranked up this year due to the rainy weather we have experienced since the beginning of this year. I would suggest just idling around the lakes because they are shallow and there are underwater stumps and logs. The lakes are relatively small in size and can be fished easily with just a trolling motor. Once the Atchafalaya River gauge at Simmesport reads 33.0 or more than the water begins creeping into some of the lower areas of the WMA. It is very hit or miss but locals catch a lot of fish in the levee pits and run out that flow back into the Red and Mississippi Rivers. Mostly crappie but sometimes bass congregate in these spots. The fishing is often boom or bust in the pits. Last year there were folks limiting out on crappie when the water was moving out through culverts and structures. However, the lakes mentioned above will provide the best stable opportunity. Fishing pressure will definitely pick up in March and April. Basic fishing license and a self-clearing permit are the only requirements.